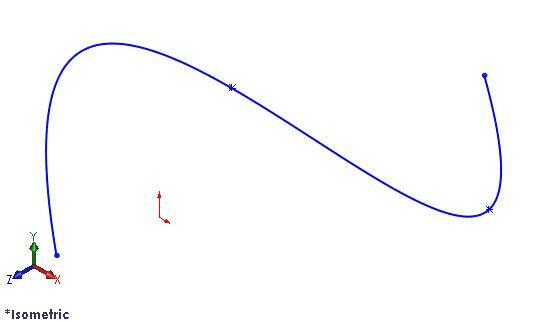 My final post on 3D curve- 3D sketch. 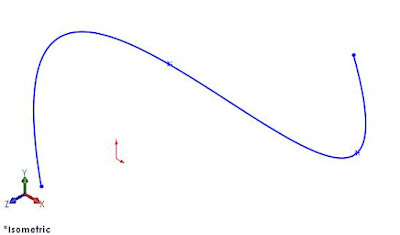 3D Sketch is a powerful tool to create a 3D curve. But if you don’t know how to use it, this powerful tool will become difficult to use. Here I’m going to show you the way I use this tool. How are we going to create a nice 3D sketch in this 3D environment, when we actually only viewing in 2D? Without rotating the view, all sketches we created are creating on any of the 3 standard views. If you cannot imagine what I’m mention above, you can open a 3D sketch; press Crtl + 7 to change to Isometric view and sketch a curve. Then press Crtl + 5 to change to top view, you can found that the sketch in created in the front plane. To create a 3D curve, sometimes we need some imagination. It is better if we can imagine what the curve look like in the front, top and right view. What I’ll do to create a 3D curve with 3D sketch is create the sketch on a standard view (Front, Top or Right) first. Then I’ll change the view to Top View to drag the point of the sketch which I create just now until I get what I want it to be on the right view. If the curve view from top not same as what you like, you can adjust it until you feel it is perfect. Hope this tips help you on your future design. Jackson (jacksonlim@cadcam.com.my) is part of the team member who good in surfacing skill in SolidWorks. You won't believe it until you see some of the exotic cars he modeled with SolidWorks.